Travel with Kevin and Ruth! : Workamping or Work Camping? Workamper News is a pay site to join. And they still send out a monthly hard copy. But there are so many free online resources now that it's really unnecessary to pay any kind of a fee to find a job. Many people ask how to find these work camping jobs, so we thought we'd put all of those resources in one place for you. I had thought perhaps that the KOA camping franchise had come up with the term workamping because KOA has their own "Work Kampers" program. We have done two stints of being Work Kampers with KOA. The first was in the summer of 2008 when we spent six weeks at the Cavendish KOA in Prince Edward Island, Canada. Sherman, in his campsite at the Cavendish KOA. It wasn't hard to work at the KOA. I had to do a couple of shifts per week driving the hay wagon ride while Ruth monitored the campers on the back. A couple of hours per week at the petting zoo cleaning up and making sure kids behaved. Once a week trash duty that took about four hours or so. And serving ice cream every Sunday at the ice cream social. It was certainly not what you would call hard work. I think we put in 18 hours per week between the two of us. And in exchange for that, we got a free campsite for six weeks. Many work camping jobs do not include any kind of salary. You are simply working in exchange for the free site. But if you do the math, you may not be getting very much for your effort. It's one thing entirely to be volunteering at a National Park and getting some personal satisfaction out of it. But if you are working cleaning toilets and raking and painting for 20 hours per week, that 80 hours per month in exchange for a $600 a month campsite means you're essentially making $7.50 an hour. You might find that you're better off paying the monthly rate at a campground and going out and getting a part time job. The Workers on Wheels website is good resource. Mostly listings for the USA, however the occasional one for Canada does pop up. Many work camping jobs are at government run parks. National Parks, State parks, and Provincial Parks are all great places to check out for work camping opportunities. Most involve being a Campground Host. So does Alberta, and Nova Scotia. And, the 280 campgrounds in the State of California. The Happy Vagabonds website has quite a few listings, as well as a section for Canada. The Working Couples website always has work camping opportunities listed, as well as possibilities outside the RV'ing world. Some interesting opportunities are out there! The RV Park Store has a pretty detailed section of help wanted ads for RV'ers. And workampingjobs.com is pretty self explanatory! That's where we met you guys in June of '08! We belong to several organizations and the one which has proven the best financially and otherwise is Workamper.com. The single most valuable feature of this service is the daily hot job emails I get - typically 6-12 jobs every day with the first word being the state the job it is in. Every position we have had has been through this daily notification, giving us an edge on others not receiving these emails. Yes, one can go with the freebies but one may lose out on a better position. WELL WORTH the $54/year. Yep, that's where we met you both. And, here we are both still working in the full-timing industry but now we are both making money doing it. Looks like it works out well for us both. Thanks for the additional website, although I think in this post Kevin was mostly referring to the "free" site in exchange for work rather than an actual paid job which I think the website you have given is for. Also meant to state the more "desirable" workamper locations, Florida and Arizona, tend to be hours for site specifically. And yes, if you do the math those park owners think very highly of the value of their sites. But many positions offer "pay for each hour worked", my top pay was $23/hr (because of my CDL). Last year and again this Oct-Dec we will be operating a pumpkin and Christmas Tree lot in California....the best situation we've had to date. A fun (but lengthy hours) way to spend a day, great owner and unbeatable pay and bonuses. Catch me on Facebook if you'd like a little more info on workamping. Thanks to Kevin and Ruth for the initial post! Yes, sometimes I think some of the parks require way to much of your time in return for a "free" site. You really have to do your homework first. However it is also nice to have a place to stay for a certain amount of time and still be able to go off and do some sightseeing which is something we can't do where we are now. The two years that we "workamped" at the KOA in Kingston was one of those places that once I worked my required hours I got paid for any additional hours I worked. The second year they wanted us back so they even reduced the amount of hours I had to work for our site and upped my weekly hours. Worked out well for us both because Kevin had two jobs in town that he worked at. Glad you enjoyed doing the pumpkin and Christmas tree lot job and that you will be going back there again this year. Guess that will be coming along soon?! You two know how to do it right---get a campsite AND get paid! So many settle for just the site, which is rarely worth it. I've been looking at those little generators lately. It's hard to justify hauling our original 4kW Kohler generator around when we almost never use it (if we've put 10 hours on it in 5years I'd be surprised). But the 2kw would run most ACs when necessary, which nobody seems to have figured out how to do with solar. It's not hard to figure out with solar. It's just much less cost efficient for most RVers. In order to run an AC you would have to have a LOTS of solar and a HUGE battery bank along with many hours of sunshine and even then you would be limited to how long you could run it for. We have always wanted to volunteer somewhere. But, we still have so many places we want to see. We think it would be an excellent way to meet so many neat people. Thanks for the great list. 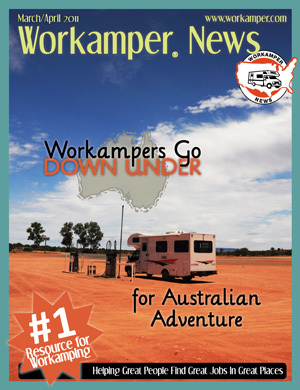 Workamper News (www.workamper.com) has been helping RVers find great jobs in great places for almost 30 years. With the largest number and largest variety of opportunity listings, you will find options from working a few hours in trade for an RV site, all the way up to career-like, salaried positions all around the U.S., and some in Canada too! There's a lot of great information and resources online for Workampers. I hope you will consider us as a one-stop-shop for your Workamping adventures! Thank you Jody, for clarifying what Workamper News includes and how it can help many other RVers that may be looking for work, either paid or in exchange for their site.